1. I've seen a lot about age-related macular degeneration (AMD) in the media lately. What is this and are there any signs to look out for? AMD is a condition where the light-sensitive cells of the macula can become damaged and stop working. The macula is the central part of the retina that provides us with detailed vision. Although it never leads to total blindness, AMD may cause the vision to be blurred or distorted. Straight lines may appear wavy or kinked. People with the advanced condition will often notice a blank patch or dark spot in the centre of their vision. To help reduce your risk of developing the condition, eat at least five portions of fruit and veg a day, especially the green leafy veg such as spinach and kale which contain lutein, a chemical that protects the macula from damage. A new class of monoclonal antibody drugs, known as anti-VEGF, are now available to treat wet AMD. NICE, the government health watchdog, has recently eased restrictions of the use of Lucentis, the only drug licensed to treat wet AMD, which is given as a series of injections. Researchers are working on developing other new treatments for AMD, including one using stem cells to treat the 90 per cent of patients who have the dry type; trials are planned to start within two years. 2. I have heard there are different types of AMD - is this correct? Yes: the two types are "wet" and "dry". The labels are based on how the condition appears, not on how it feels to the sufferer. Dry AMD is the most common form, affecting about 90% of all sufferers. It develops slowly causing gradual loss of central vision. Unfortunately there is no effective treatment; however, optical magnifiers and other devices can be helpful with reading and other fine detailed tasks. Wet AMD results from new blood vessels growing behind the retina. This causes bleeding and scarring, which then leads to some loss of vision. Wet AMD can develop quickly and can cause more devastating sight loss than the dry form. A number of very promising treatments have been developed which will prevent further deterioration of the vision or even restore some of the lost sight. 3. My mother has cataracts. How do these develop and is there anything I can do to avoid getting them myself? One in three people over the age of 65 has a cataract which, left untreated, can significantly impair vision. Cataracts are cloudy or opaque areas that develop in the normally transparent lens of the eye. The lens behind the coloured iris where its job is to help focus the light entering the eye. The lens must be transparent for us to see clearly and sharply. The predominant symptom is blurred vision but others may include double vision, glare sensitivity and loss of contrast or colour saturation. As with AMD, smoking and poor nutrition are significant risk factors for cataract. There is also thought to be a genetic susceptibility; however the biggest risk factor is age - if you live long enough you are almost certain to get some cataract. Long-term sun exposure is also known to raise your risk, so don't forget to wear your sunglasses when necessary. 4. What causes dry eye syndrome? Is there anything I can do to prevent it? Dry eye syndrome is a term that covers a number of conditions that are characterised by a lack of good quality tear production. As a result, the eye becomes dry and painful. Central heating, air conditioning and regular computer use can all make it worse. It is thought that around 15% of adults over the age of 40 have dry eye and it affects twice as many women as men. It may not be possible to identify the exact cause and provide a permanent cure for dry eye, but there are a number of effective treatments that reduce symptoms and improve comfort. Lubricating eye drops can soothe irritation and reduce discomfort and special plugs to block the tear duct can stop excessive tear drainage. You can help your body to produce better quality tear fluid. Include lots of omega-3 in your diet. This is found in oily fish, fortified breads, walnuts and sesame seeds. Other dietary supplements that might improve the condition are flaxseed and evening primrose oil. 5. Can anyone get glaucoma? The most common kind of glaucoma affects around two in every 100 people over the age of 40. Risk factors for primary open-angle glaucoma include increasing age and a family history of glaucoma and it is more common in Afro-Caribbean people. Glaucoma leads to permanent loss of vision and, if untreated, will lead to blindness. You won't know if you have glaucoma as it produces no symptoms in the early stages, so screening tests are vital to detect it before there is significant loss of vision. An optometrist can do these during a sight test. Ideally, everyone over 40 should have their eyes checked for glaucoma every two years. People aged 40 or over who have a child, parent, brother or sister with glaucoma should have an annual check and are entitled to free NHS eye tests. 6. I see lots of black spots in front of my eyes - should I be worried? "Floaters", as these black spots are called, are very common and tend to increase with age. They are caused by a change in the 'vitreous humour', the jelly-like substance that fills the eye. The vast majority of floaters are harmless, but if you suddenly develop a lot or a very large one, especially if accompanied by flashes of light, it might signal a more serious problem with the retina. If this happens then see an optometrist as soon as possible. 7. My optometrist wants to put drops into my eyes to look at the back. Is this a good idea? Sometimes it very difficult to get a good view through the pupil at the back of the eye. This is more likely in older people where the pupil becomes increasingly small and where a little bit of cataract is obscuring the view. An optometrist or eye doctor may use drops to relax the muscles that control the pupil and allow it to become bigger. This will enable him or her to get a much better view of the retina and other structures, and so to determine the health of your eye more accurately. Pupil dilation is a very common and safe procedure, but your pupil will be enlarged for a few hours. This may cause some glare and mild discomfort on a bright day, and your vision may seem a little blurred. For these reasons, it is advisable not to drive to your appointment. 8. I'm struggling to read a book easily. Do I need reading glasses? If you are approaching your late 40s or beyond, then, yes, you may do. You may find that the problem is especially troublesome in poor light and when you are tired. As we age, the lens loses its ability to focus on near objects as it becomes less flexible. Unfortunately no amount of exercising or treatment can prevent this happening, but reading glasses can correct the problem. 9. What steps can I take to keep my eyes healthy? If you smoke, stop. Smoking significantly increases the risk of developing cataract and age-related macular degeneration. Maintain a healthy diet and weight; obesity has been shown to increase the risk of developing AMD and a lack of certain antioxidant vitamins such as A and C has been shown to be a risk factor again for both cataract and AMD. Consider taking nutritional supplements particularly if there is a family history of AMD. 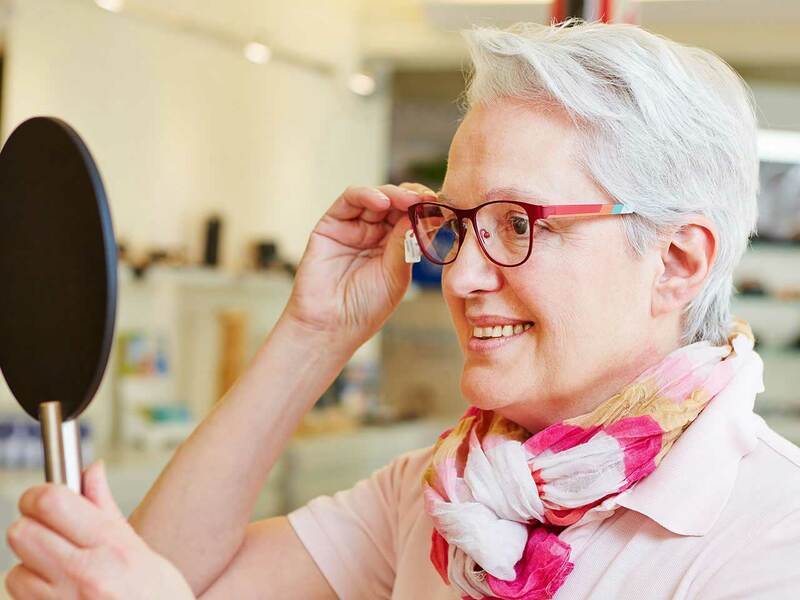 There are several types specifically designed to promote eye health such as iCaps and Vital Eyes are available from opticians, pharmacies and health shops. 10. I've got good vision, so why do I need to visit an optometrist regularly? Regular eye tests can pick up many eye problems which are age-related or occur more frequently in older people. They can also pick up a number of general health problems such as high blood pressure and diabetes. Some potentially blinding conditions such as glaucoma cause no symptoms so you could be losing vision without realising it. It is recommended that you have a sight test at least every two years. Glaucoma: can you see to drive?